HELP! 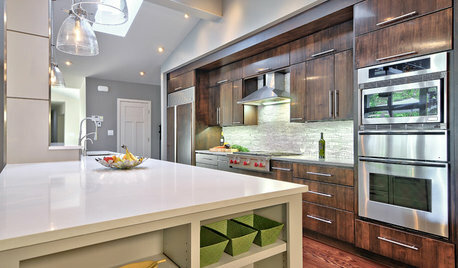 What color island countertop???? Hello corder84, Marie here. 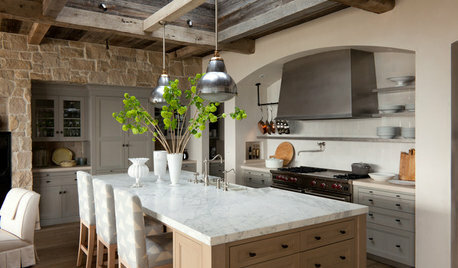 You have a gray and white kitchen- the options for your island are endless. You can do marble, which is premium and lovely to do baking on but there will be maintenance. Polished Snow White Marble Calcutta Azul Aran Granite which will have black, charcoal, grey and bits of warm brown to even some veins of orange-rust to compliment your hardwood floor colour. Or you can push it more traditional and choose a granite slab that feels more orange to pull up your flooring colour - like this Bianco Antico Slab In any event - due to the neutral and very nice selections you've made for your kitchen, the options are literally endless. Take a color swatch of all your materials in this room, including baseboard paint colour, wall paint colour, hardwood flooring, cabinetry, tile backsplash and quartz countertop to the SLAB Wholesaler in your area (NOT your fabricator) but the wholesaler that brings in slabs of quartz, granite, marble, travertine, onyx, etc. etc. 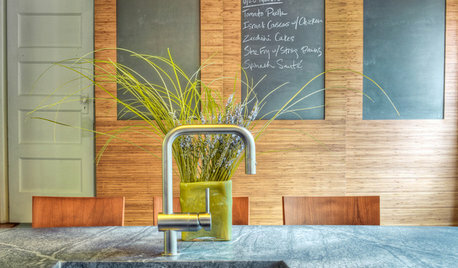 - Spend an hour reviewing all the options WITH your samples from YOUR kitchen. 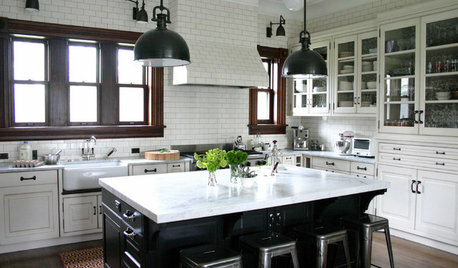 Choose the top three that really excite you as being perfect for your kitchen, and have them priced out. Choose based on your love and price point you are most comfortable with. Good Luck with your project! On my screen, Paloma Polar looks to creamy for me. I would stick to the more white looks. 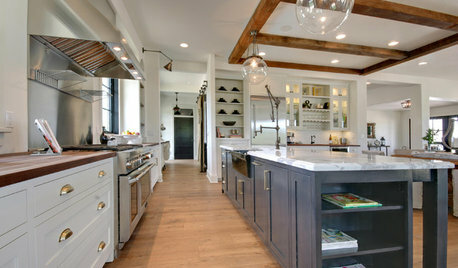 that makes the best combo with the blue cabinets and gray flooring. The only thing about the Calcutta Marble is &quot;does it look to fake&quot;. I'd rather do pure white than fake anything! If you know what I mean. Have you checked out the Quartz products. 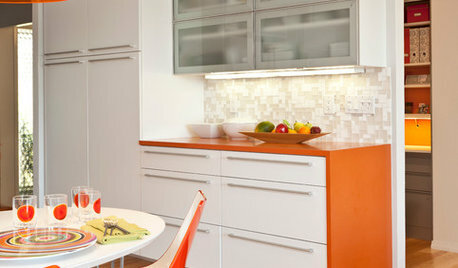 I love the Cambria London Sky for this color combination. If your kitchen isn't real large, it might not be that big of a cost over the laminate and it will give a much richer look. I'd check that out anyway. Looks like cultured marble to me, which many builders use as a standard, forcing most homeowners to upgrade. 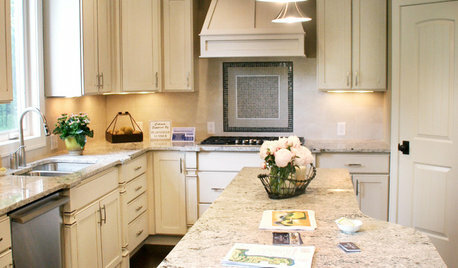 Check with your local countertop fabricators and see if any of them offer remnant pieces for sale. 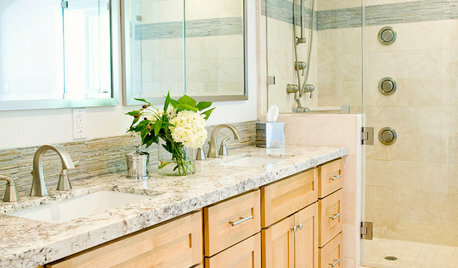 If so, you can do granite or quartz countertops on small vanities for much less cost and they will be more durable and attractive. I can assure you, your builder knows what the countertop is made from and his realtor and or salesperson should also know. 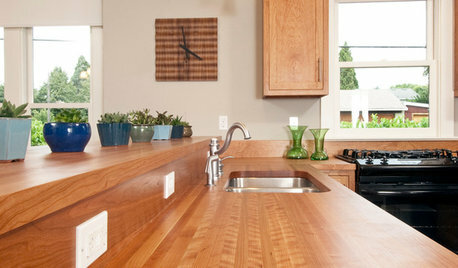 Your builder should be able to help you find countertop fabricators who offer remnants for sale. For a kitchen or larger countertop you will not be able to use remnants and will need to purchase full slabs - but if it fits your budget, it is well worth it! In my area, for a small vanity, it actually costs about the same to do a remnant countertop as a cultured marble countertop. What color quartz countertop for masterbath white vanity? Hi Mary, The tile flooring looks lovely so far! A couple of great quartz brands are PentalQuartz (composite of natural quartz) and Silestone (combination of quartz and other raw materials). 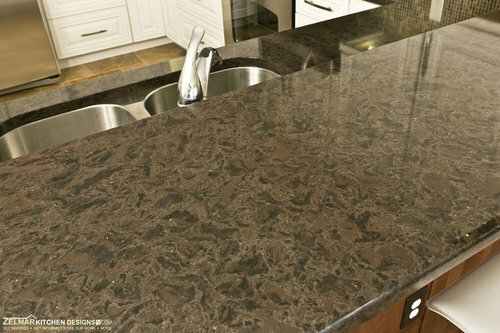 Below are a few colors that you may want to consider within these two brands: PentalQuartz Cascade White Polished (white with tiny gray speckles) PentalQuartz Carrara Polished Silestone Blanco Maple (whitish gray with medium sized organically shaped speckles) Here are the links to the full range of colors: http://pentalquartz.com/collection/ https://www.silestoneusa.com/colors/ Hope this helps!